The Makemakes are a rock group founded on 1 May 2012 and coming from Flachgau, Salzburg and District Vöcklabruck. The name is derived from the dwarf planet Makemake, which, in it's turn, was given the name of a creator deity Makemake, the creator of humanity and god of fertility in the mythos of the Rapa Nui, the native people of Easter Island. "We guess that us being a "real" rock band could be one thing that differs us from others. We didn't just come together for the upcoming event. Two of us have been performing with each other since we were 9 years old. And we've been doing the kind of music you know us also for a while now"
Just one month after establishing itself the group has released their first single, "The Lovercall". The band became famous for it's performance in 2013 as Opening act for Bon Jovi in ​​Vienna Krieau, also appearing at Surf Worldcup in Podersdorf. Also to their popularity has contributed the rumour, often cited in press, that lead singer of the group, Be Muhrer Dodo, is an illegitimate son of actor Christoph Waltz. Another single "Million Euros Smile", released in 2014, also successfully landed on 2nd place in the national charts. During the song-writing camp, The Makemakes worked with songwriter Jimmy Harry, who both wrote two potential Eurovision songs with them as well as produced them in Los Angeles. Songwriter, composer and producer Jimmy Harry has worked with stars such as Madonna, Kylie Minogue, Pink, Kelly Clarkson and Santana. Recognized at the 2012 Golden Globes by the Hollywood Foreign Press Association, he won "Best Original Song" with Madonna and Julie Frost for the song "Masterpiece". After the show "I Am Yours" has been compared with Coldplay's "The Scientist", however, ORF stated that result of expert analysis has concluded that there is no plagiarism between the songs, and it is no disgrace to sound somewhat is style of Coldplay. "In many ways it is the greatest honor for us: First, it would be historic to follow directly Conchita Wurst, and Second, to defend the title at home. 2015 more or less ran into us. We gave it a chance and things worked out. We simply are lucky. We wrote a very competitive song that perfectly goes with our "usual" style. Songs like that happen, one can't construct or plan them. We do it for the love to the music." ESCKAZ had the opportunity to meet The Makemakes from Austria on their visit to Moscow as part of "Vienna 12 Points" campaign. The Makemakes are a band from the Salzkammergut. "We're living on a beautiful landscape between mountains and lakes and rivers, so we're really down to Earth guys, we also like to party and the most things we like are music and women". Their music is a good mixture of Soul, Pop & Rock’n’Roll. "The fact that we are best friends since years unites us in a band", say the performers. The unusual title of the band is explained with astronomy: "When you are standing at a very special spot in our hometown and you look to the south – you can see a shining little star, a dwarf planet called MAKEMAKE!". 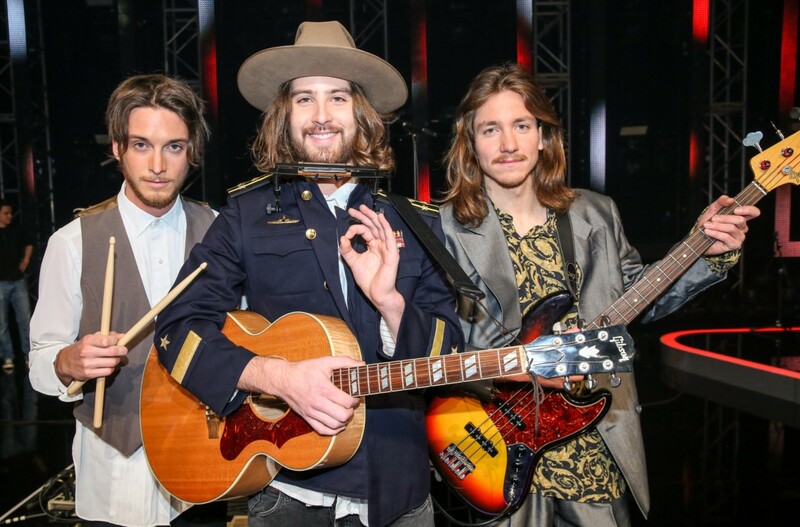 At the Eurovision 2015 The Makemakes will be performing "I Am Yours", which they define as an ode to friendship. 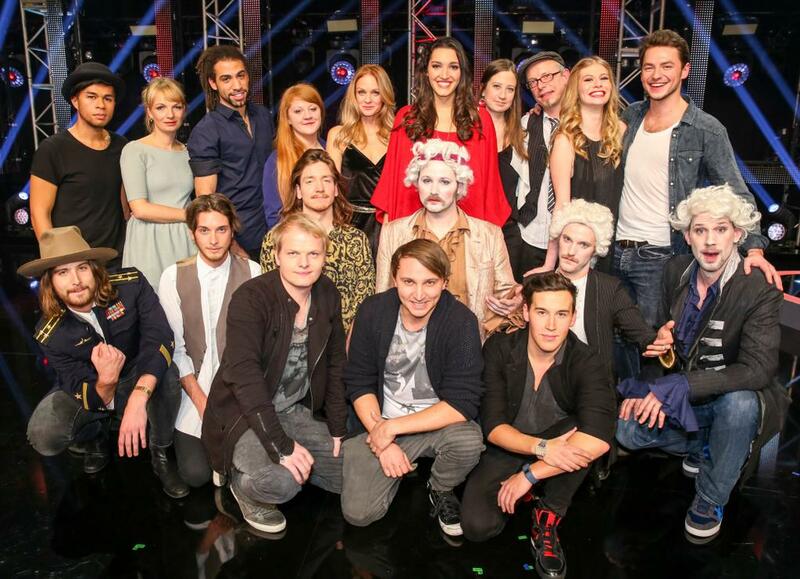 The song was born during song-writing camp set by Austrian broadcaster ORF for all the participants of the national selection. "Jamming, delicious white wine and a cool guy called Jimmy Harry were an inspiring combination". Two songs were created at the camp, with second being "Big Bang", yet the mentors of the competition have decided to leave "I'm Yours" in the running: "We love both songs but we also think that "I Am Yours" is a good choice for the ESC". After the national final "I Am Yours" has been compared with Coldplay's "The Scientist", however, ORF has declared that result of expert analysis has concluded that there is no plagiarism between the songs. The Makemakes also agree it is is no disgrace to sound somewhat is style of Coldplay: "There are definitely worse things than being compared with Coldplay!". The band has no plans to bring any changes in the song: "We definitely will not change anything – the song is great the way it is! ", they say. The band says they would love to hear a trap remix of their entry, if some DJ can offer them to do it. Speaking about the international show, the Makemakes are really looking forward to Eurovision, and are enjoying their preparation period and the promotional tour that takes them to 9 European countries. They have already visited Slovenia, Hungary, and after Russia it is Serbia, Romania, Czech Republic and Estonia, as well as Eurovision parties in Amsterdam and London. Meanwile, the band also will have several gigs on Austrian soil: Klagenfurt, Graz, Innsbruck, Salzburg, Vienna and Telfs. The debut album of the band will be released in May, and will have all kinds of influences from Billy Withers to Jimi Hendrix to Michael Jackson to Thin Lizzy. "Stay excited! ", they say. "We plan to light up the whole stage. May be we will even burn it, well just kidding. Some people wanted us to do dance moves, some people wanted us to do big light show, but we don't need that, we want just music and nothing else, we're still thinking about it. On stage we often do some more musicians doing the stuff that I'm recording alone in the studio. We also often take three backings singers with us, who also play instruments: organ, piano and tambourine. So we will be using backing singers at Eurovision as well"
The Makemakes add they are excited to listen to the songs of the other countries, but haven't much time to do it. "Today I've heard Russian song, it's really well produced and singer is looking really hot. One of my other favourites is Finland. I think that we can be quite in the top, but can't say for sure", says Dodo Muhrer. "We are really looking forward to the ESC. For more Information about The Makemakes – follow us at Facebook and Instagram"
Ljubljana, Budapest, Moscow, Krakow, Belgrade, Bucharest and Prague - all these cities have visited The Makemakes at the invitation of the City of Vienna and its liaison offices in the past seven weeks. Yesterday, on Tuesday, May 5, 2015 they were together with the Vienna City Councillor Christian Oxonitsch and the executive producer of "Eurovision Song Contest" Edgar Böhm in the Czech capital. At a press conference, there was also a reunion (they have already met at the "London Eurovision Party") with the Czech representatives Marta Jandová and Václav Noid Bárta. Both presented during an evening reception at the Fashion Club Prague their Eurovision entries. At the end of the press conference there have appeared a surprise guest by: Karel Gott, who has represented Austria at the 1968 ESC and who came to wish good luck to all participants of the show. "We are delighted that the Czech Republic again this year takes part in the Eurovision Song Contest", said Councillor Christian Oxonitsch during the press conference. "This underlines the good relations between Vienna and Prague, which also build on the work of our Vienna Liaison Office here in Prague. In Vienna, the last preparations are in progress for the song contest to be in full swing!". The Makemakes: "The international meetings in Europe and concerts in Austria, our promotional tour is coming to the end. It was very nice and exciting, but also stressful time. In addition, we have also been working on our debut album that got the finishing touches and will be released on May 15". Marta Jandová: "We are very happy that we are part of this event, but we are also getting nervous - some 200 million viewers will be watching us. 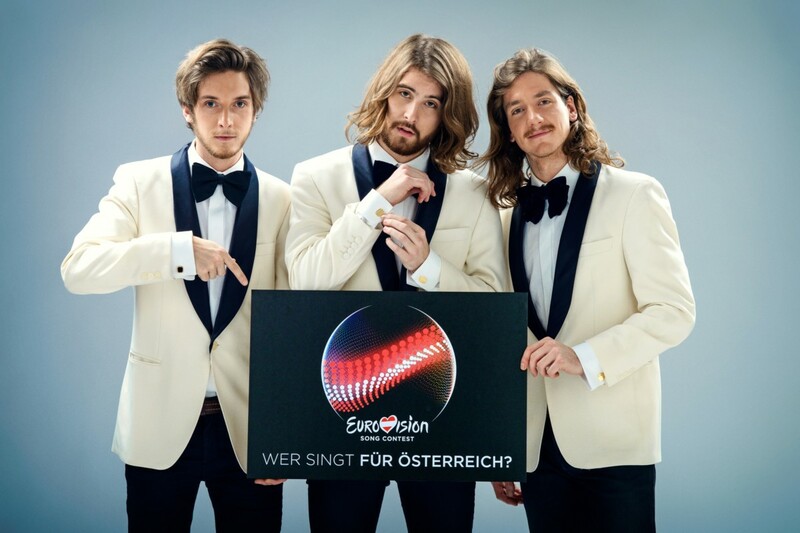 With the Makemakes we have already met in London - Austria is true to it's recipe for success: beards and long hairs". Just before the "Eurovision Song Contest" Austrian representatives The Makemakes left their familiar territory and try to be brewers - and in the Ottakringer brewery they yesterday together with brewmaster Martin Simion prepared their own beer. A total of 3,000 bottles of "The Makemakes - Das Bier" will be served at "Welcome to Austria" party on May 17 in the "Euro Club" in the Ottakringer brewery. The beer is an English Pale Ale, made from Austrian raw materials - Pilsner malt and Magnum hops. Thus, it's quite an appropriate contribution to the "Building Bridges"! Matthias Ortner, chief of Ottakringer Brewery: "The passion for music combines Ottakringer brewery with the Eurovision Song Contest. As the host for the official Euro Club the brewery will serve as a meeting place for artists, journalists and delegates. 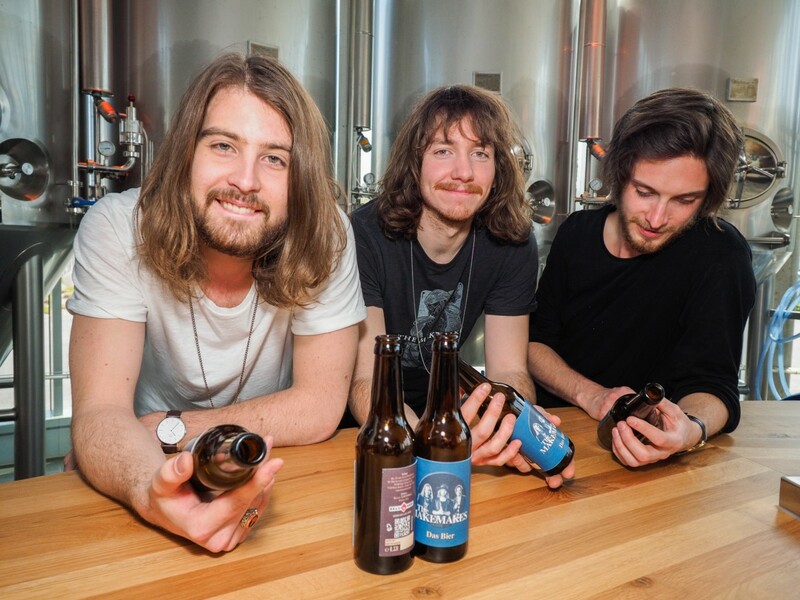 We're also connected to music through recently launched new brewing factory "Craft Brewery", which operates under the motto "Brewed with love and music". Therefore we are particularly pleased that our Austrian candidates The Makemakes together with our team have created their own specialty beer". The Makemakes: "It has always been a dream of ours to brew our own beer - mainly because my grandpa was brewmaster", says Mark, and the band is in agreement: "We believe that we have got a very good, fruity Beer with a balanced Malt premium and strong hop aroma - incidentally also suitable for non-beer drinkers!" After "Eurovision in Concert" in Amsterdam The Makemakes met yesterday, Tuesday, April 21, 2015 in Belgrade once again the Serbian ESC representative Bojana Stamenov. At the invitation of the City of Vienna and their liaison offices in the Serbian capital both Eurovision Song Contest participants have attended press conference. At the reception, both presented their Eurovision Song Contest entries titled "Beauty Never Lies" (Bojana Stamenov) and "I Am Yours" (The Makemakes). The Makemakes: "Bojana is a genuine "soul machine", really powerful lady, and we get along great with her. Belgrade is impressive city with pretty girls and very good food. We are pleased that we are able to visit ahead of Song Contest wide variety of European cities". Bojana Stamenov: "The boys of 'The Makemakes' are so cute - and I like their style, the old-school rock flair of the 70s, they remind me of the supergroup Cream. I like their song, it's totally cool and optimistic rock ballad. I am pleased to be the host today, and I enjoy this short time until the Eurovision when we all get together again in Vienna"
Special Eurovision 2015 press conference was held today at Krakow’s Pod Różą Hotel. ORF's press manager Roman Horacek has presented to the Polish press concepts of Eurovision in Vienna while representatives of Austria The Makemakes and Poland Monika Kuszyńska also got first opportunity to meet each other. At the end of the evening they have presented their contest entries - "I Am Yours" and "In The Name of Love". 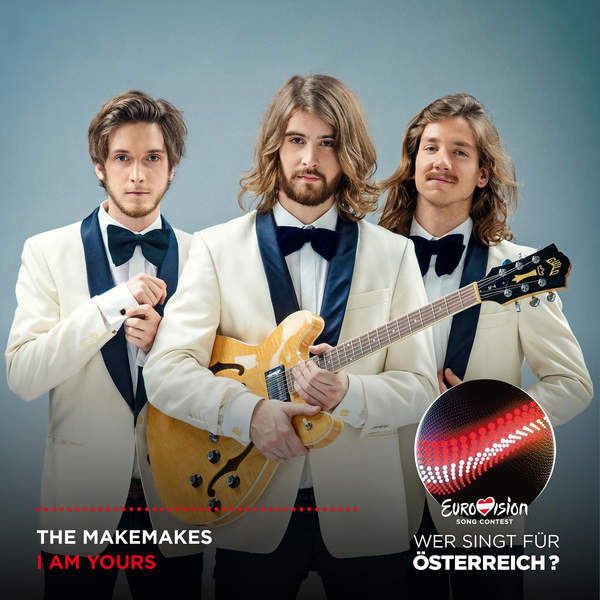 The Makemakes: "We are delighted to be able to represent Austria at the ESC, and thanks to this we also have the opportunity to visit various European cities - including the really beautiful Krakow, where we also met Monika Kuszyńska. It's great to meet many passionate musicians and to be able to communicate with them again in May on the ESC stage". Monika Kuszyńska: "I am very pleased that I was able to attend this event and got a chance to meet Austria's representatives at the ESC, The Makemakes. I would like to congratulate The Makemake with their song "I Am Yours", which I really liked". "Wildsau Dirt Run" - a mud-covered running track in Lower Austria, in which participants agonize over 5, 10 or 20 kilometers run through the dirt, starts the new season, and will acts as a filming location for the ESC postcard of the Austrian participants of Eurovision Song Contest The MakeMakes, who will be inserted in the line-up of participants of the run. And before the run they will provide a small musical warm-up on the stage. As part of their promotional tour across Europe The Makemakes are building bridges between Austria and several European countries. Yesterday, on Wednesday, 1 April 2015 they were invited by the City of Vienna and their liaison offices to Budapest, Hungary, where they took part in a special press conference. In this context, there was also a first acquaintance with Hungarian ESC representative Boggie and the subsequent reception in the gallery "Szépháron" where both performers have presented their Eurovision entries. The Makemakes: "It's been a stressful time, but now it is also a great time that we come very much around and visit so many beautiful cities.". About their acquaintance with Boggie they go on to say "It's nice to meet other participants before the ESC. With Boggie we have equally well understood each other, she is also a singer-songwriter and her song is really good". Boggie: "I really like The Makemakes style of music, which meets exactly my taste and of course being singers-songwriters we can always understand each other". Organizers of the Eurovision Song Contest 2015 has started international promotion of the event, which will included presentation of the show and it's "Building Bridges" concept in 15 largest European cities. Several of those events will be attended by Austrian representatives "The Makemakes". On Wednesday, 18 March, they were invited by city of Vienna and their liaison offices in the Slovenian capital Ljubljana to attend special press conference. In this context, there was also a first acquaintance with Slovenia ESC representatives Maraaya and the subsequent reception at the City Museum, where both groups have performed their entries. Watch the video from the event here, performance by Maraaya of The Makemakes song here. Next TV appearance of The Makemakes will take place at the Peter Rapp's "The Brieflos Show" on Sunday, March 22, at 17.55 clock on ORF 2. Further international events such as similar presentations in Budapest, Moscow, Krakow, Belgrade, Bucharest and Prague as well as performances in Amsterdam (April 18: Eurovision in Concert), London (April 26: London Eurovision Party) and Tallinn are also in their program before Eurovision. "At events like this do you really get the Eurovision fever - it is exciting to know the other acts and to stand with them on stage together. Maraaya are a super act, we have equally well understood each other, they also sang our song in their own version, and we also find their song cool. If we get same great understanding with everyone, then it will be a great fun for us in Vienna"
Details of the new format were announced by ORF on 28 October 2014. Sixteen acts, scouted by a team of music professionals, which included singer-songwriter Anna F. and manager and musician Alex Deutsch, will compete in the show. Read more about the participants here (in German). In the first show on 20 February 2015 (prerecorded on 2 December 2014), a special expert panel has decided which six acts will proceed to the next stage. No televoting was applied, but fans were asked to vote online after the show. These 6 acts have later been coached by the special coaching team - Anna F, Nazar and The BossHoss and had the experience of working with international top professionals ranging from Golden Globe winner Julie Frost, who wrote ESC winning song "Satellite" for Lena Meyer-Landrut, to the American producer Jimmy Harry, who produces, among other hits for Bruno Mars, Pink and Madonna has. In addition, project was supported by Creative Producer Lukas Hillebrand and Wolfgang Schlogel aka I-Wolf. In the second show, the remaining six acts have showcased their vocal skills and talent. First each act performed one of their favourite cover versions, and then they were asked to present a song that would surprise their audience. The audience voted for their favourites, although nobody was eliminated. The Makemakes, Celina Ann and Folkshilfe got the highest number of points, however online poll results were different. In the third show, the six acts will perform two candidate songs each, which will be contributed by Austrian and international producers. Only one song for each act will proceed to the final. On 7 March finalists will take part in a special Club Concert in Vienna, taking part in Chaya Fuera at 19:00 CET. The show will be hosted by Andi Knoll. In the final on 13 March 2015, and the only show to be broadcasted live, the six acts will perform their entries and the winner will be decided by a 50-50 combination of televoting and international jury voting. Juries will represent 10 countries: Latvia, France, Australia, Netherlands, Spain, Israel, United Kingdom, Germany, Slovenia, Italy. Each of jury had included 5 members, that are related to Eurovision in some way. For example, juries included heads of delegations of Italy, Latvia, Israel, The Netherlands, France and Germany, Slovenia and Latvia entrants in ESC 2014, French entrant in ESC 2012, musical director of France leading radio, chief editor of Dutch radio, TV/Radio producers, backing singers, journalists, musicians and ESC fans. Juries have been voting based on previous show videos. The results were announced by spokesperson, being embassies stuff or volunteers but not members of the jury itself. In order to create the perfect environment for creative artists, finalists went for a week into a songwriter camp on the castle Schloss Wasserburg in St. Pölten. Here they had the opportunity to devote themselves fully to their songwriting. They were supported by the internationally renowned songwriters and producers, who later worked on their songs in studios of Austria, Germany and US. In the show aired on March 6, each performer will present two potential Eurovision entries with coaches Anna F., Nazar and The BossHoss deciding at the end, with which song acts will pass into the live final. The Makemakes worked with songwriter Jimmy Harry, who both wrote songs with them as producedthem in Los Angeles. Julie Frost came from US to Austria to help band Folkshilfe with songwriting. Their songs have been produced by Vlado Dzihan. 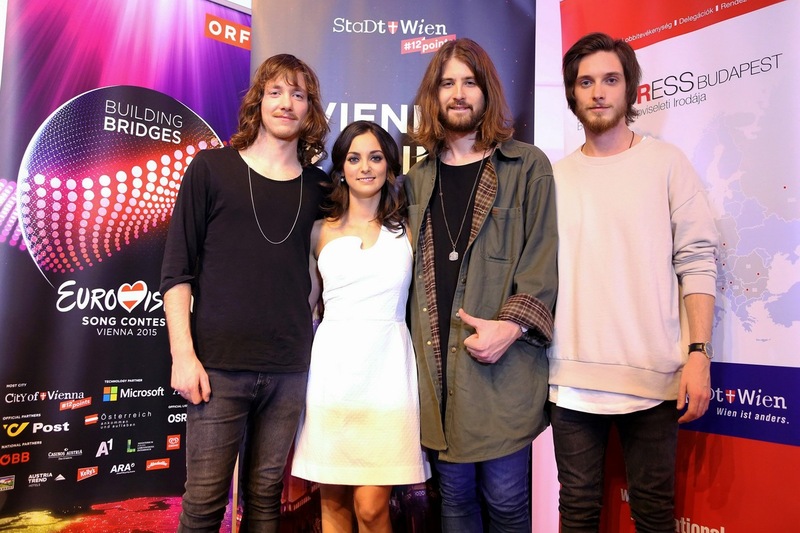 Celina Ann received support from British Ian Dench, and American Sharon Vaughn and her songs were later produced by Philipp Schwär in Hamburg. DAWA had consulted with Lukas Hillebrand and worked with Jimmy Harry, before their songs were worked on by Patrick Pulsinger in the studio. Johann Sebastian Bass got support both in songwriting and in the studio from Wolfgang "Amadeus" Schlögl aka I-Wolf. Zoe once again worked with her father Christof Straub. The Makemakes - рок-группа, основанная 1го мая 2012 года, и происходящая из Флашгау, Зальцбург и района Фёклабрук. Название группы заимствовано из названия третьей по величине карликовой планеты Солнечной системы Макемаки, которая, в свою очередь, названа в честь Маке-маке — создателя человечества и бога изобилия в мифологии рапануйцев, коренных жителей острова Пасхи. "Думаю, что то, что мы - "настоящая" рок-группа, отличает нас от других. Мы не просто собрались специально для выступления на конкурсе. Двое из нас выступают друг с другом с того момента, как нам было по 9 лет. И уже много лет мы делаем ту музыку, по которой вы нас знаете"
Всего спустя месяц после создания группа выпустила свой первый сингл, "The Lovercall". Группа стала известной благодаря своему выступлению на разогреве Бон Джови во время его концерта в Krieau, Вена. Также они выступили на Кубке мира по сёрфингу в Подерсдорфе. Помимо прочего, популярности группе прибавил слух, часто упоминаемый в прессе, о том, что солист группы Морер Додо - незаконнорожденный сын актера Кристофа Вальца. Новый сингл группы "Million Euros Smile" вышел в продажу в 2014 году, и успешно достиг второй строчки национального чарта. Во время сессии по написанию песен, The Makemakes работали с популярным американским автором Джимми Харри, который написал для группы две потенциальные песни Евровидения, а также спродюсировал их в Лос-Анджелесе. Композитор и продюсер Джимми Харри работал с такими исполнителями как Мадонна, Кайли Миноуг, Пинк, Келли Кларксон и Сантана. На премии 2012 года Golden Globes он стал обладателем приза за "Лучшую Оригинальную песню" с Мадонной и Джули Фрост за песню "Masterpiece". После национального отбора песню "I Am Yours" сравнили с песней Coldplay "The Scientist", однако, телеканал ORF сразу же заявил о том, что экспертный анализ пришел к заключению, что никакого плагиата между двумя этими песнями нет, а нет ничего постыдного в том, чтобы звучать в стиле, напоминающем Coldplay. "Это большая честь для нас по многим причинам. Прежде всего, выступать на Евровидении сразу после Кончиты Вурст сразу - это историческое право, а во вторых - мы будем защищать титул в домашнем конкурсе. 2015 год прямо врезался в нас. Мы дали ему шанс и все сработало. Нам просто повезло. Мы смогли написать конкурентоспособную песню, которая прекрасно подошла нашему "обычному" стилю. Песни, подобная этой просто случаются, их нельзя сконструировать или запланировать. Мы делаем это ради любви к музыке." ESCKAZ получил возможность пообщаться с группой The Makemakes из Австрии во время их визита в Москву в рамках кампании "Вена - 12 баллов". The Makemakes - группа из Зальцкаммергута. "Мы живем на очень красивой местности, между горами, реками и озерами. Мы очень приземленные ребята, но любим гулять и веселиться, а больше всего в жизни нам нравятся музыка и женщины". Их музыка представляет собой смесь соул, поп-музыки и рок'н'ролла. "Нас объединяет то, что мы - лучшие друзья уже много лет", рассказывают исполнители. Необычное название группы объясняется астрономией: "Если вы встанете на особенную точку в нашем городе и посмотрите на юг - вы увидите там яркую маленькую звезду, а точнее карликовую планету - Makemake!". На Евровидении 2015 группа The Makemakes исполнит песню "I Am Yours", которую они называют одой дружбе. Песня родилась во время специального композиторского лагеря, открытого национальным вещателем ORF для всех участников национального отбора. "Музыкальные джем-сессии, восхитительное белое вино и очень крутой чувак Джимми Харри стали большим вдохновением для нашего творчества". В рамках проекта были созданы две песни, второй стала "Big Bang", но наставники артистов оставили в конкурсе "I'm Yours": "Нам нравятся обе песни, но мы считаем, что "I'm Yours" - это хороший выбор для Евровидения". После национального отбора песню "I Am Yours" сравнили с песней Coldplay "The Scientist", однако, экспертный анализ, проведенный телеканалом ORF пришел к заключению, что никакого плагиата между двумя этими песнями нет. The Makemakes согласны с тем, что нет ничего постыдного в том, чтобы звучать в стиле, напоминающем Coldplay. "Определенно есть вещи похуже, чем сравнение с Coldplay! ", говорят музыканты. Группа не планирует вносить каких-либо изменений в песню: "Мы определенно ничего не будем меня - песня превосходна в том виде, как она звучит сегодня!". Группа не отказалась бы услышать трап-ремикс на свою песню, если кто-то из диджеев сможет им его предложить. Говоря о международном шоу, The Makemakes отмечают, что с нетерпением ждут поездки на Евровидение, получают удовольствие от подготовки к конкурсу и своего промотура, в рамках которого они посетят 9 европейских стран. Они уже побывали в Словении, Венгрии, а после России посетят еще Сербию, Румынию, Чехию и Эстонию, а также примут участие в вечеринках Евровидения в Амстердаме и Лондоне. Тем временем, у группы запланированы также несколько концертов на австрийской земле: Клагенфурт, Грац, Инсбрук, Зальцбург, Вена и Тельфс. В настоящее время группа завершает работу над своим дебютным альбомом, который выйдет в мае и будет включать в себя влияния от Билли Уизерса до Джими Хендрикса, от Майкла Джексона до Thin Lizzy, и говорит всем, "Ждите его с нетерпением!". "Мы планируем зажечь всю сцену. Может быть мы ее реально сожжем, шучу. Некоторые хотят, чтобы мы делали какие-то танцевальные движения. Некоторые хотят, чтобы мы устроили большое световое шоу. Но нам не нужно это, мы хотим просто петь музыку и ничего более. Поэтому мы пока думаем. На сцене мы всегда используем дополнительных музыкантов, которые играют то, что я записываю в студии один. Также мы обычно возим с собой трех бэк-вокалистов, которые также играют на инструментах: органе, фортепиано и бубне. Поэтому, на Евровидении с нами тоже выступят бэк-вокалисты"
The Makemakes говорят, что с нетерпением ждут возможности услышать песни других участвующих стран и уже слышали несколько из них, но не имели времени на большее. "Сегодня, я впервые услышал российскую песню, она очень хорошо спродюсирована, и певица выглядит просто великолепно. Также моим фаворитом является Финляндия. Думаю, что мы можем попасть в топ, но не могу сказать с уверенностью", говорит Додо Мюрер. "Мы очень ждем нашей поездки на Евровидение! Если вы хотите узнать о The Makemakes подробнее, следите за нами в Facebook и Instagram"
Любляна, Будапешт, Москва, Краков, Белград, Бухарест и Прага - все эти города посетили участники группы The Makemakes по приглашению мэрии города Вены и ее представительств за последние семь недель. Вчера, во вторник, 5 мая они побывали вместе с представителем городского собрания Вены Кристианом Оксоничем и исполнительным продюсером Евровидения Эдгаром Бёмом в столице Чехии. На пресс-конференции также произошла новая встреча уже знакомых по вечеринке в Лондоне артистов - представителей Австрии и представителей Чехии Марты Яндовой и Вацлава Ноида Барты. Во время вечернего приема в Fashion Club Прага они представили вниманию собравшихся свои конкурсные песни. В конце пресс-конференции появился неожиданный гость: Карел Готт, представлявший Австрию на Евровидении 1968, который пожелал удачи участникам шоу. "Мы рады тому, что Чехия в этом году снова принимает участие в конкурсе Евровидение", заявил Кристиан Оксотонич во время пресс-конференции. "Это подчеркивает хорошие отношения между Веной и Прагой, что также основывается на работе нашего представительского офиса в Праге. В Вене сейчас завершаются все подготовительные работы перед началом конкурса". Репортаж программы Seitenblicke вы можете увидеть здесь. The Makemakes: "Международное турне в Европе и концерты в Австрии, наш промо-тур подходит к концу. Было очень интересно, но иногда и довольно сложно. Также параллельно с туром мы завершали работу над нашим дебютным альбомом, который выйдет в свет 15 мая". Марта Яндова: "Мы очень рады принимать участие в этом мероприятии, но мы начинаем и несколько нервничать, за нами будут наблюдать 200 миллионов зрителей. С The Makemakes мы уже встречались в Лондоне - Австрия придерживается собственного рецепта успеха на конкурсе: бороды и длинные волосы". Незадолго до начала Евровидения, представители Австрии The Makemakes решили покинуть знакомую им территорию и попробовать стать пивоварами - вчера в пивоварне Ottakringer участники группы и пивовар Мартин Симион презентовали новую эксклюзивную марку пива. 3000 бутылок эксклюзивного "The Makemakes - Das Bier" будут предложены гостям вечеринки "Welcome To Austria", которая пройдет 17го мая в "Евроклубе" в пивной Ottakringer. Пиво The Makemakes - это английский Pale Ale, сделанный из австрийского сырья - солода Pilsner и хмеля Magnum. Таким образом, оно вполне подпадает под девиз "Возводя мосты"! Маттиас Отрнер, глава пивоварни Ottakringer: "Страсть к музыке объединяют пивоварню Ottakringer с конкурсом Евровидение. В качестве месторасположения официального Евроклуба конкурса, пивоварня станет местом встреч для артистов, журналистов и делегатов конкурса. Мы также связаны с музыкой через недавно запущенный новый пивоваренный завод "Craft Brewery", который действует под девизом "Сварено с любовью и музыкой". Поэтому, мы особенно рады тому, что наши австрийские конкурсанты The Makemakes вместе с нашей командой представили их собственное эксклюзивное пиво". The Makemakes: "Мы всегда мечтали когда-то выпустить собственную марку пива, особенно потому, что мой дедушка был пивоваром", говорит Марк, а другие участники группы соглашаются с ним. "Мы считаем, что у нас получилось очень хорошее фруктовое пиво со сбалансированным вкусом солода и сильным ароматом хмеля, которое, кстати, идеально подходит даже для тех, кто особенно не любит пиво!" После "Eurovision In Concert" в Амстердаме The Makemakes снова встретились вчера 21го апреля в Белграде с представительницей Сербии Бояной Стаменов. По приглашению мэрии города Вены и партнеров в столице Сербии два участника Евровидения посетили совместную пресс-конференцию. Во время приема, оба конкурсанта представили собравшимся СМИ свои конкурсные песни - "Beauty Never Lies" (Бояна Стаменов) и "I Am Yours" (The Makemakes). The Makemakes: "Бояна - настоящая "соул машина", очень мощная певица, и мы с ней легко поладили. Белград - прекрасный город с красивыми девушками и хорошей кухней. Мы рады тому, что можем перед Евровидением посетить различные города Европы". Бояна Стаменов: "Ребята из 'The Makemakes' очень милые - нам нравится их стиль, чувство олд-скульного рока 70х годов, они напоминают мне супергруппу Cream. Мне очень нравится их песня, отличная, оптимистичная рок-баллада. Я рада возможности приветствовать их в нашем городе сегодня, и я получаю большое удовольствие от подобных моментов перед тем, как мы все снова все вместе встретимся в Вене"
Специальная пресс-конференция, посвященная Евровидению, прошла сегодня в Pod Różą Hotel в Кракове. Пресс-атташе телеканала ORF Роман Хорачек познакомил польскую прессу с концепцией Евровидения 2015 в Вене, а представители Австрии The Makemakes и Польши - Моника Кушиньска получили первую возможность встретиться друг с другом. В завершение вечера они представили свои конкурсные песни - "I Am Yours" и "In The Name of Love". The Makemakes: "Мы чрезвычайно рады возможности представлять Австрию на Евровидении, и благодаря ей - посетить ряд Европейских городов, включая очень красивый Краков, где у нас также появилась возможность встретится с Моникой Кушиньской. Замечательно встречать столько ярких музыкантов, и мы будем рады новой встрече в мае на сцене Евровидения". Моника Кушиньска: "Я очень довольна тем, что смогла посетить это мероприятие и встретиться с представителями Австрии на Евровидении, The Makemakes. Мне хотелось бы поздравить их с очень удачной, на мой взгляд, песней "I Am Yours", которая мне очень понравилась.". 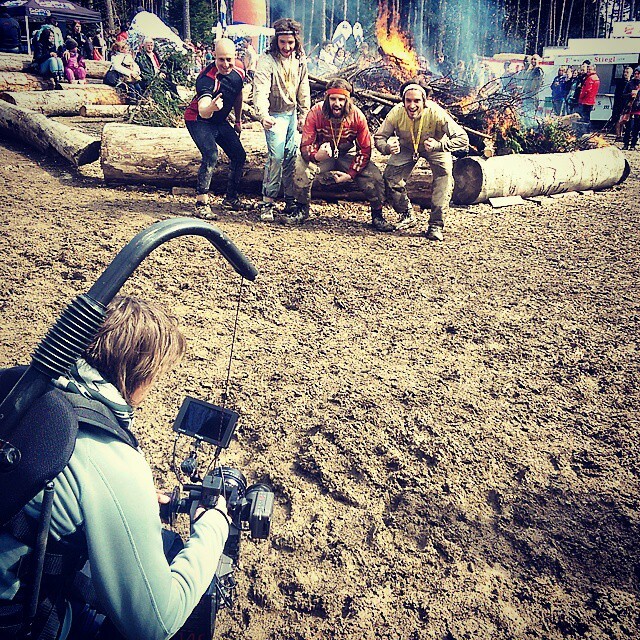 "Wildsau Dirt Run" - забеги в грязи по специальному треку в Нижней Австрии, в которых участники пробираются через грязевые препятствия на дистанциях 5, 10 и 20 км, начинают свой новый сезон. Один из стартовых забегов станет местом для съемки открытки Евровидения для представителей Австрии The Makemakes, которые также выйдут на старт грязевого забега. А перед его началом они дадут небольшое музыкальное выступление на сцене. В рамках своего промо-тура переж Евровидением The Makemakes возводят мосты между Австрией и рядом Европейских стран. Вчера, 1го апреля, по приглашению мэрии Вены и ее представительства они побывали в Будапеште, Венгрия, где приняли участие в специальной пресс-конференции. Во время нее также произошло первое знакомство с представительницей Венгрии на Евровидении Богги, а на приеме в галерее "Szépháron" оба участника Евровидения исполнили свои конкурсные песни. The Makemakes: "Для нас это было достаточно сложное время, но сейчас мы получаем большое удовольствие от всех этих поездок и посещения разных красивых городов.". По поводу своего знакомства с Богги, они отметили "Очень приятно встречаться с другими участниками перед Евровидением. С Богги мы сразу же нашли общий язык, она тоже является автором песен и исполнителем, и у нее очень хорошая композиция". Boggie: "Мне очень нравится стиль музыки The Makemakes, который идеально подходит моему вкусу, и, конечно, то что мы с ними являемся и авторами и исполнителями помогает быстрее понять друг друга". Организаторы Евровидения 2015 начали промо-кампанию перед конкурсом, которая будет включать в себя презентацию шоу и его концепции "Building Bridges" в 15 крупнейших городах Европы. Ряд из этих мероприятий посетят представители Австрии группа "The Makemakes". В среду, 18го марта, они были приглашены мэрией города Вены и их коллегами из словенской столицы Любляны посетить специальную пресс-конференцию. В ее рамках также состоялось первое знакомство с представителями Словении - группой Maraaya, и прием в Городском Музее, где обе группы исполнили свои конкурсные песни. Видео со встречи можно увидеть здесь, исполнение Maraaya песни The Makemakes здесь. Следующее телевизионное появление "The Makemakes" произойдет в программе Петера Раппа "The Brieflos Show" в воскресенье, 22го марта, в 19:55 Москвы на телеканале ORF 2. Также запланировано их участие в аналогичных презентациях в Будапеште, Москве, Кракове, Белграде, Бухаресте и Праге, а также выступления в Амстердаме (18 апреля, Eurovision In Concert), Лондоне (26 апреля, London Eurovision Party) и Таллинне. "На подобных мероприятиях ты действительно подхватываешь лихорадку Евровидения - очень интересно знакомиться с другими исполнителями, и выступать вместе с ними на одной сцене. Maraaya - потрясающая группа, мы легко нашли с ними взаимопонимание, они даже исполнили нам нашу песню в собственной обработке, и нам очень понравилась и их песня. Если у нас будет подобное взаимопонимание со всеми участниками конкурса, то в Вене все пройдет очень весело"
Детали нового формата отбора были объявлены телеканалом ORF 28 октября 2014 года. В отборе примут участие 16 исполнителей, подобранных командой профессионалов, в число которых входили певица и автор песен Anna F. и продюсер и музыкант Алекс Дёйч. Подробнее с ними вы можете познакомиться здесь (на немецком). В первом шоу, которое выйдет в эфир 20го февраля (в записи от 2 декабря), специальное жюри решило, какие 6 из 16 исполнителей достойны того, чтобы пройти в следующую стадию национального отбора. Телеголосование на этом этапе не применялось, однако, поклонникам была дана возможность проголосовать на сайте телеканала после шоу. После этого 6 финалистов вновь взяли под свое крыло профессионалы - специальная команда тренеров в составе Anna F., Nazar и The BossHoss, также им предоставилась возможность работать с международными профессионалами, начиная от обладателя Golden Globe Джюли Фрост, написавшей победную песню "Satellite" для Лены Майер-Ландрут, американского продюсера Джимми Харри, который создавал хиты для Бруно Марса, Пинк и Мадонны и до австрийцев - креативного продюсера Лукаса Хиллебранда и Вольфганга Шлогеля, известного также как I-Wolf. Во втором шоу, оставшиеся шесть участников продемонстровали свои вокальные умения и талант. Сначала каждый из них исполнил одну из своих любимых кавер-версий, а затем их попросили исполнить песню, которая смогла бы удивить зрителей. В конце программы аудитория проголосовала за фаворитов, The Makemakes, Celina Ann и Folkshilfe набрали наибольшее количество баллов (однако в онлайн опросе результаты отличались), но шоу никто не покинул. В третьем шоу, они исполнят по две новые, специально написанные для них песни, подготовленные австрийскими и зарубежными продюсерами. В финал будет допущена только одна песня от каждого исполнителя. 7го марта финалисты примут участие в клубном концерте в Вене, который пройдет в Chaya Fuera в 19:00. Ведущим шоу станет Анди Кнолл. В рамках финального шоу 13го марта, и единственного, которое будет транслироваться в прямом эфире, шесть финалистов исполнят свои конкурсные песни, и победитель будет определен путем сложения результатов голосования телезрителей и голосования международного жюри. Международное жюри будет представлять 10 стран: Латвию, Францию, Австралию, Нидерланды, Испанию, Израиль, Великобританию, Германию, Словению и Италию. В состав каждого из жюри входило по 5 человек имеющих то или иное отношение к Евровидению. Например, в состав жюри входили главы делегаций Италии, Израиля, Нидердандов, Франции, Германии, прошлогодние участники из Словении и Латвии, представительница Франции на Евровидении 2012, музыкальный директор крупнейшей радиостанции Франции, главный редактор голландского радио, ТВ и Радио продюсеры, бэк-вокалисты, журналисты, музыканты и фанаты Евровидения. Жюри голосовало на основе просмотра видеозаписей выступлений с предыдущего шоу. Результаты голосования объявляли представители посольств или волонтеры, не входившие в состав жюри. Для того, чтобы создать подходящую творческую среду для артистов, финалисты отправились на неделю в специальный лагерь подготовки, расположенных в замке Schloss Wasserburg в Санкт-Пёльтене. Здесь они получили возможность полностью посвятить свое время написанию песен. В выполнении задач им помогали международно-признанные авторы песен, а затем над композициями в студиях Австрии, Германии и США продолжили работу продюсеры. В рамках шоу, которое выйдет в эфир 6го марта, каждый исполнитель продемонстрирует по две потенциальные конкурсные композиции, и жюри в составе наставников - Анны Ф., Назара и The BossHoss, решит, какую из двух песен каждый участник исполнит в финале национального отбора. The Makemakes работали вместе с автором Джимми Харри, который также впоследствии спродюсировал композиции в студии в Лос-Анджелесе. Джули Фрост из США помогала в сочинении песен группе Folkshilfe. Продюсированием их композиций занимался Владо Дзихан. Селина Анн получила поддержку от британского автора Яна Денча и американки Шарон Вон, а спродюсировал ее песни Филипп Швяр в Гамбурге. DAWA консультировались с Лукасом Хиллебрандом и работали с Джимми Харри, а в студии с их песнями занимался Патрик Пулсингер. Иоганн Себастьян Басс получил помощь как в написании композиций, так и в продюсировании от Вольфганга "Амадея" Шлёгля, известного также как I-Wolf. Зои вновь работала со своим отцом Кристофом Страубом.